A prefect gift set or simple beginning set of paint sticks for your aspiring student artist. Also, suitable for the classroom, and for adults looking for a new way to liven up their art. Shiva Paintsticks set of 12 Student Colors is a multipurpose purchase. The are manufactured in the he united states and are an excellent choice for a student artist or for the art classroom. The painsticks have no offensive odor (which is helpful in interesting children in painting), and they are self-sealing and easy to maintain. However, their usefulness is not limited to art students. 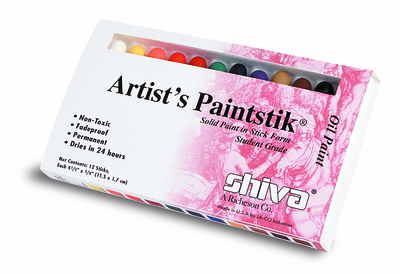 Experienced painters may want to pick up the Shiva Paintsticks in order to experiment with sketching or outlining. Your sketch or outline can be blended and mixed with traditional paint within your piece. The lack of odor also means you can take your paintsticks almost anywhere your inspiration leads you, and paint on mealy anything from canvas to paper to panel.